Trying to figure out what to feed your family? 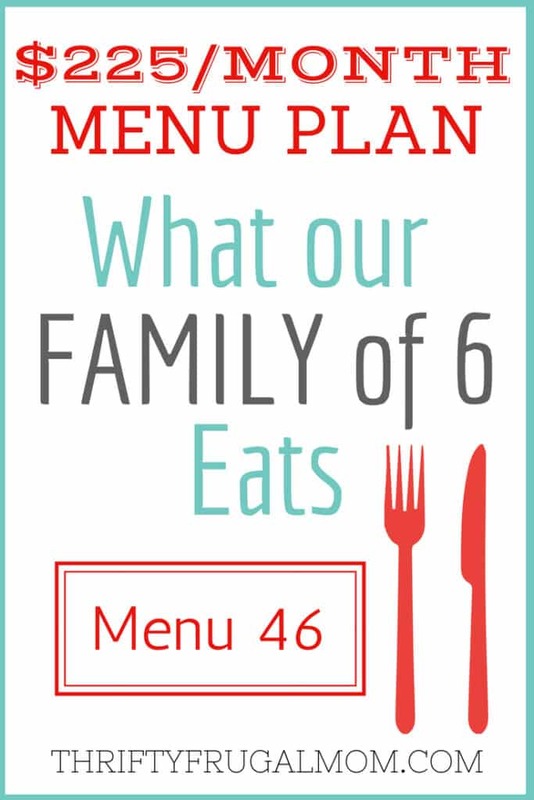 This menu for a family of 6 can help! 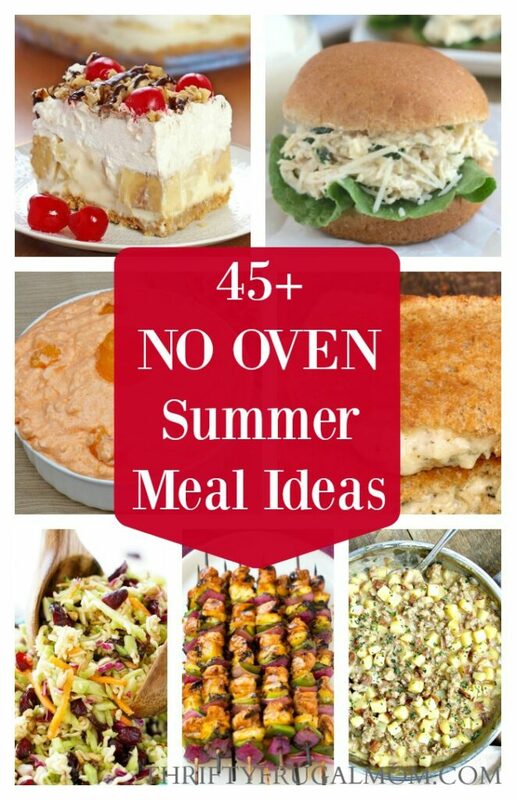 It’s budget friendly and includes lots of simple, kid friendly meals. I know how tiring it can be to always be thinking about what to make to feed your family. And that’s why I try to share these menus with you fairly regularly, to hopefully help give you inspiration and ideas. Because I know how helpful that is for me! Our family of six consists of two adults, a 10 year-old boy, a 6 ½ year-old girl, a 4 ½ year-old girl and a 2 year-old boy- all of our kids eat more than pretty much any other kids I know. It’s not uncommon for any of the older 3 to eat as much as I do. I have a stockpile. My cupboards are full from previous shopping and here’s why. When I can get pasta for free with coupons, I buy as much as I have coupons for. If I’m able to get flour for $0.50/bag like I did last fall, I’ll buy half a dozen and put them in the freezer to use as needed. I do this as much as my budget allows, on as many items as I can and as a result save lots of money. Then when I go to plan menus, I simply plan our meals around what I already have in my cupboards and freezer, as much as possible. Obviously I still might have to buy a few things at regular price here and there, but by stocking up when the price is at rock bottom I save a lot. I cook almost totally from scratch. That means when I make a cake, I almost always make them from scratch. I make my own bread totally from scratch. I rarely use pre-packaged sauces. I make my own cream soups and pie crusts. Making your own food is typically less expensive and healthier too. Our breakfasts consist of Homemade Granola or Baked Oatmeal, the occasional bought cereal that I was able to get for $0.50/box and sometimes some fruit too. I know that might seem awfully boring to some of you, but we actually all really enjoy it and prefer it over other breakfast food. I also have a homemade iced coffee, homemade frappe or some other fun beverage every morning. It’s just one of the little things that I do to help me have a productive day! – We had 5 guests enjoy lunch with us. – We had 8 guests enjoy dinner with us. – We had a carry in lunch at church and this is what I took. – This homemade pizza crust recipe is awesome! Not only does it need no time to rise, you can have it ready to go in the oven in 30 minutes! And it’s really tasty too. The only thing I do differently is pre-bake the crust a bit before putting on the toppings. With finances tightening to a one income home and with the addition of a teenage driver, I am looking forward to trying your meal plans. I am on a specialty diet so $200 may be unrealistic for us but this should give me some good ideas for meal combinations. Here is to new life adventures! I love your attitude, Helen! That alone should help you do well at figuring out ways to make your tighter income work. :) And yes, specialty diets have a way of adding in lots of extra costs, for sure. But, I think a lot of the principles that I use, such as making your own food, keeping meals simple, shopping sales etc. still will help you out! Blessings as you find ways to make things work! I love your frugal and direct style. I'm struggling with the realities of food sensitivities to nightshades (potato, tomato, peppers, eggplant, goji berries etc), dairy, citric acid and fruits except banana, pear, blueberries, and gluten. I'm thrilled to see healthy meals for $225/month...adjusting that to my life is a slow process. Keep up the awesome writing! I love it. Thank you so much for your encouragement, Rachel! Food allergies would definitely make it challenging to keep to a low grocery budget! We've been blessed with not having to deal with that so far. Blessings as you continue to try to figure out how to do that well. You have wonderful meal plans with lots of variety!! I understand you keep a stocked pantry, but I'm having trouble understanding how $225 can buy enough food to feed 6 people for 30 days. That's 18 meals a day, or 540 meals a month! That comes out to $0.42 a meal. Do you ever post receipts or a weekly shopping list with prices so people can get an idea of how much food you are buying for $225? You say your 3 oldest kids eat as much as an adult, so essentially you are feeding 5 adults and 1 child on $225 a month? I'm super happy you are able to do that, but again, it would be helpful to see the QUANTITY of food you purchase a week / month. I feel like I'm good at meal planning and only buying what is on sale. I know $225 can buy a lot of food, but I'm having trouble seeing how it would be enough food for 540 meals. We spend around $300 a month on food (not including household items, pet items, and my husband's sodas :) ) for two adults and a 4 year old. Melinda, first of all, thank you for your questions! And I never realized before that when broken down, our meals cost just $0.42! That kind of surprised even me! I can totally understand how this might seem kind of not doable and I'm going to try to answer your questions and help you make more sense of how I make this work. I no longer post receipts or weekly shopping lists with prices but for a couple of years, I did post my weekly shopping trips, along with the breakdown of what everything cost. You can find those here. I'm guessing it might be helpful to understand how I make this work, and the shopping trips that I did then would be similar to how I still shop. I stopped doing the posts for two reasons: they were super time consuming to do and they didn't typically get a lot of traffic, so I finally decided that it wasn't worth my time. Yes, our children are big eaters. Our 2 oldest especially often eat as much as I do. Our 3rd child has slowed down in eating though and my husband no longer has a manual labor job and as a result, doesn't eat nearly as much as he used to. But, I would say that we eat as much as a typical family, and probably on the heavier side actually. It's kind of hard to say because I came from a family of big eaters and my husband did to, so when I compare us to them, it seems pretty normal. But then we have friends over or I babysit other people's kids and I realize that we do eat more than a lot of people! Two other things that are probably good to understand (and that I talk about in the weekly grocery shopping posts that I used to do). One is that I use a lot of coupons. It's not uncommon for me to get several items for free after coupons and sales each week. For example, this week at Shoprite, I can get two Lantana hummus for free. 2 Lantana Hummus on sale $1.99 each - (2) $1.00 printable coupons from lantanafoods.com - (2) $1.00 savings on Ibotta for Lantana TOTAL COST: FREE! Now hummus isn't something that I normally buy, but for free? I'll take it! This same kind of thing happens all the time on all sorts of products. We don't eat much processed food, so sometimes the free deals are on those things too. Occasionally, I'll go ahead and get them because they are free, but most of the time I don't bother just because I'm not crazy about processed foods. But if we ate that way, I could do even better! And many times the item isn't free, but is just a super great price. For example, next week Butterball ground turkey is on sale at ShopRite for $2.50. There is a $0.75 printable coupon available currently and ShopRite's double coupons, so I will get $1.50 off, meaning I'll only pay $1.00 for a pound of ground turkey. That's a super good price and I can freeze it, so I'll get as many as I can print coupons for, which will probably be 4. The other thing that is necessary to understand is the fact that I do a lot of the gas deals at Giant. (You can read this to learn more.) Basically, Giant grocery store has deals each week where you earn so many points when you buy a certain number of specific items. Those points then can be redeemed for savings on gas. I do this regularly and we pretty much always have enough points to get a tank of gas for "free". But, I put the savings from the gas back into my grocery budget, which might be kind of confusing and as I'm typing it here, I realize that it could even sound like I'm being dishonest and trying to skew my grocery budget numbers to sound better. But you'll have to just trust me that that isn't the case. I put it back in my grocery budget, because often times, I wouldn't buy the items except that they are "free" after gas savings. So for example, next week I can get Stonyfield yogurt for better than free. I typically make my own yogurt, but if I can get good yogurt for a moneymaker, then I will! Here's the deal that I'm planning to do: 4 Stonyfield Organic Mulitpacks $3.50 each - (4) $1.00 Stonyfield printable coupons (we have two computers which is how I can print 4 coupons) PAY: $10.00 - Get back $10.00 in gas savings - redeem for (3) $1.00 Ibotta Stonyfield offers We actually live in a rather high priced area, but I often can get household supplies, toiletries and diapers for super cheap or free too using these same methods. I hope that helps make a little more sense of things! And please, feel free to ask more questions too. I love sharing about grocery savings and enjoy trying to help others get ideas of how they can save on groceries too. And for what it's worth, I really don't think $300 is a crazy amount to spend on food each month. From what I hear from other moms, that's actually a pretty decent grocery budget. :) And besides, grocery budgets can't be cookie cutter and work the same for everyone, can they?! Hey there! So far I've made Yoghurt, granola, oat choc chip bars and most recently the gingerbread cake. I get so many compliments on each dish! Thank you so much for sharing, I'm completely in love with your site!! So glad to have you here, Natalie! And I absolutely love hearing that my recipes are working well for you. That makes what I do feel totally worth the time and effort it takes! And of course, if you ever have any feedback for me or ideas of what you'd like to see done differently, please let me know! I'm here to serve you and try to help make your life a little easier. :) Here's to more yummy recipes! In your newsletter, I just read how you save so much on groceries. Very impressive. However, if you think it's expensive where you live, try coming to central Maine. For the most part, I am just not able to get deals the way you do. Nevertheless, the lessons can be applied to the stores we have around here---basically Hannaford, Shaws, Target, and Wal-Mart. So many thanks for taking the time to share. Hey, Laurie! Yes, food prices are high here, at least compared to lots of the US, but thanks to Aldi and double coupons I can still do fairly well. (I don't think Maine has Aldi, do they?) As you mentioned though, there are definitely areas where the costs are higher than here and when I see the prices that my friends in Canada pay? I feel incredibly grateful! But like you said, no matter where we live, we can use money saving principles and find ways to save...and that's the whole point, because we're all going to have different time constraints, diets, prices etc. But there are definitely things that we can all do to save, no matter where we live! I just found your site and think it's really awesome! I was wondering if there's any way to print out the meal plans? Welcome, Leslie! So happy to hear that you are enjoying my site. :) I'm sorry, I currently do not have a way to print out my meal plans, but it is something that I'm considering working at offering. Please let me know if you have any other questions or if there are any suggestions you have on how I can serve you better. Okay. No problem. I'll figure it out!